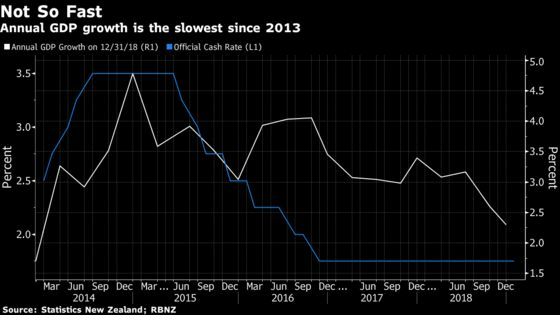 (Bloomberg) -- New Zealand’s economy expanded at a faster pace in the fourth quarter, easing concerns of a pronounced slowdown that could force the central bank to cut interest rates. Gross domestic product rose 0.6 percent, driven by construction and services spending and up from 0.3 percent in the third quarter, Statistics New Zealand said Thursday in Wellington. While the growth matched economists’ median forecast, the annual pace slowed more than expected to 2.3 percent, the weakest since 2013. New Zealand’s dollar climbed almost half a U.S. cent after the release as investors scaled back bets on a cut to the official cash rate later this year. The Reserve Bank has said it isn’t planning to raise borrowing costs until early 2021 amid benign inflation and slowing global growth. The kiwi dollar bought 69.20 cents at 1:19 p.m. in Wellington, compared with about 68.70 before the report. The currency had already surged just hours earlier as the U.S. Federal Reserve surprised markets by signaling it would pause interest-rate increases this year after previously projecting two hikes. The chance of an RBNZ rate cut by November edged down to 48 percent from 52 percent, according to swaps data compiled by Bloomberg. Quarterly growth was slower than the 0.8 percent projected by the Reserve Bank in its February policy statement. “With GDP growth slowing over 2018 by more than the RBNZ had expected, and with downside risks to 2019 growth accumulating, there is still the risk of an OCR cut in 2019,” said Jane Turner, senior economist at ASB Bank in Auckland. Still, “the next likely move is a hike in 2021,” she said.